Bryce Hudik of Evergreen, right, drives to the hoop in a game last season. He averaged nearly 11 (10.7) points per game a year ago. Chandler Lumbrezer lays one in for Evergreen versus Delta last season. He averaged just over seven points per game in his junior season. 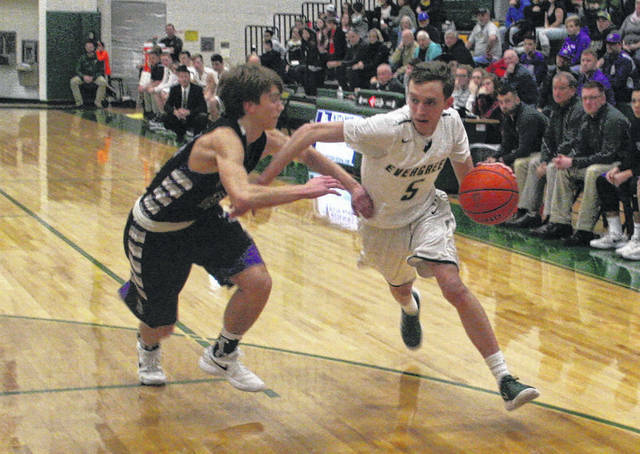 Mason Loeffler of Evergreen with a putback basket in a game at Swanton last season. He received several postseason honors following an impressive sophomore season. 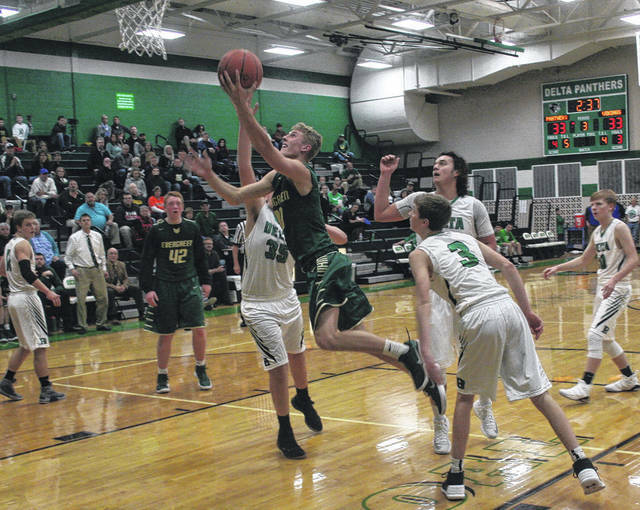 Look for Evergreen boys basketball to be heavy contenders in the Northwest Ohio Athletic League with three all-league performers returning from a team that finished third a season ago. The Vikings lose just one letter winner from last season, Josh Dowling (honorable mention All-NWOAL, second team District 7). But, they return seven quality athletes. Their most notable returnee is Mason Loeffler, who was first team All-NWOAL, second team District 7 and third team All-Northwest District last season. The junior averaged nearly 15 (14.8) points per game in 2017-18. Other key players back are Nate Brighton (second team All-NWOAL, honorable mention all-district), Bryce Hudik (honorable mention District 7), and Chandler Lumbrezer (honorable mention District 7). Hudik was the Vikings’ second leading scorer at 10.7 ppg, Brighton averaged 8.6 ppg and Lumbrezer 7.3. They also return Zach Lumbrezer, Jack Etue and Mason Henricks. Newcomers for the Vikings are Brian Fritch, CJ Houck, Ethan Loeffler, Nic Borojevich and Evan Lumbrezer. However, to win a league title, there are always areas that need to be perfected. “Our greatest weakness is defensive rebounding, and free throw shooting,” said Keifer. In his preseason poll, the Viking coach has his team finishing third in the league behind Archbold and Wauseon. Keifer then has Bryan finishing fourth, Swanton fifth, Patrick Henry sixth, Liberty Center seventh and Delta eighth. Evergreen begins the season Monday, Dec. 3 when they visit Ottawa Hills. 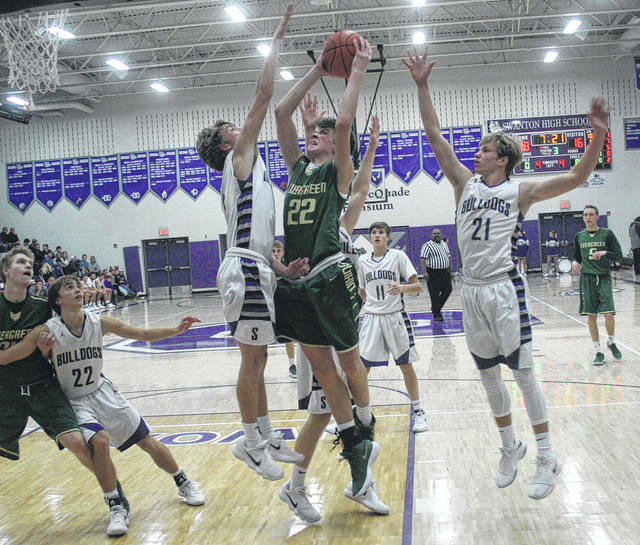 https://www.fcnews.org/wp-content/uploads/sites/45/2018/12/web1_Hudik-drives-on-Gilsdorf.jpgBryce Hudik of Evergreen, right, drives to the hoop in a game last season. He averaged nearly 11 (10.7) points per game a year ago.